Franklin & Marshall President Barbara Altmann engaged in a conversation with the community Aug. 30, telling students, faculty and professional staff to stop worrying about the misguided “crisis” in the humanities and embrace the humanities as a great standard of education. Altmann, a French professor and medievalist who just began her tenure as F&M’s 16th president, chose a conversational format for the semester’s first Common Hour, a community discussion conducted every Thursday during the academic year. Seated on stage in the Alumni Sports and Fitness Center (the event returns to Mayser Gym next week), Altmann took questions for the first half hour from Gretchen Meyers, associate professor and department chair of classics, Renee Yoder, assistant to the vice president of admission, and senior public health major Tyler Schubert, from Mechanicsburg, Pa., before taking questions from the large audience. 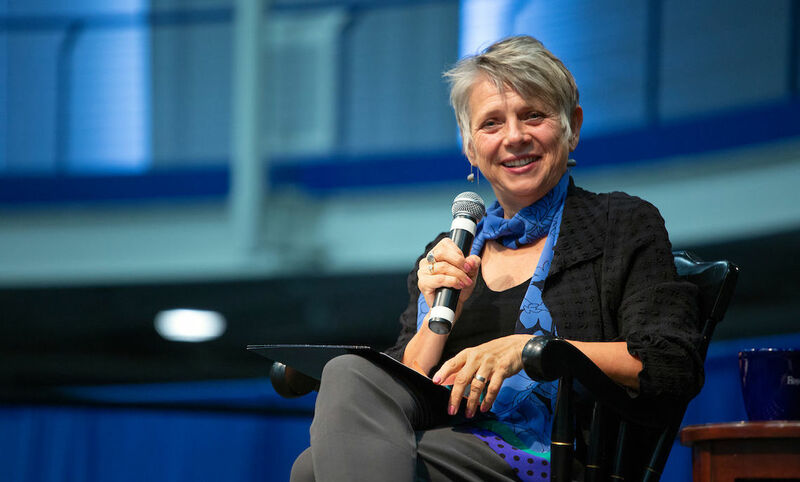 After an introduction by Meyers, Altmann, F&M’s first woman president, remarked about having so far spent a considerable amount of her time on campus in the ASFC, including Convocation two days earlier. Altmann praised Common Hour as one of the “great ideas” that attracted her to the College and promised to attend regularly during the times she’s on campus. She recognized “another president” in the room, Brandon Schneider, president of the Diplomatic Congress, and her husband, John Stacey, a psychologist who was seated in the first row. In response to a question about her first impressions of F&M, Altmann said she made two “stealth visits” to the campus, one during a raging winter snow storm, and another on a spring day when the cherry trees were in bloom. Asked what it means to be a member of the F&M family, Altmann described the College with its unique residential learning experience as holistic and nurturing in its approach to students.